The main suspect in the death of rapper Nipsey Hussle is facing life in prison after he was officially charged with murder on Thursday (04Apr19). Eric Holder was taken into custody by authorities in Los Angeles on Tuesday (02Apr19), and his bail was set at just over million (£5.3 million). 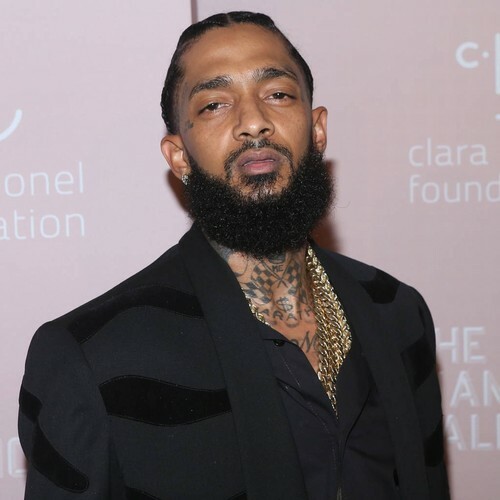 He stands accused of gunning down Nipsey, 33, outside his Marathon Clothing store in Crenshaw, Los Angeles on Sunday (31Mar19). Holder has been held in solitary confinement since his arrest, amid concerns he would be a target if placed in the jail's general population. The news emerges hours after Hussle's brother, Samiel Asghedom, paid an emotional tribute to his late sibling in an interview with ABC News. "He was a brother, a musician, an entrepreneur, a people's champ," he said. "He was somebody that believed in the process of hard work, determination and just the positivity of somebody staying in the area that he grew up in and making something out of nothing." Samiel added, "He was a role model to the community, to the kids, and to the mothers and the grandmothers and the community that watched him grow up and seen him as a youngster, a family man, a father, raising his kids." Hussle had two children - a two-year-old son named Kross with his longtime girlfriend, model Lauren London, and a daughter, called Emani, from a previous relationship.